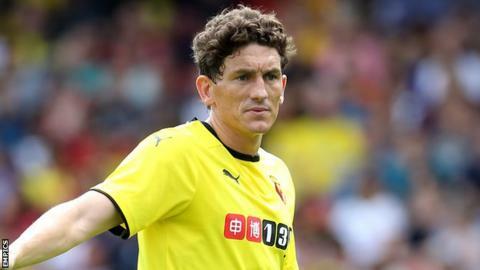 MK Dons boss Karl Robinson has said Keith Andrews cannot join the club until a deal is agreed with Watford. Midfielder Andrews is at the Hornets on a season-long loan from Bolton, but is not in the plans at Vicarage Road. Watford want to recoup as much money as possible from their outlay, mainly in wages, for the 33-year-old. "It will be a financial matter. If we meet Watford's evaluation of him it can be done tomorrow, but we can't," Robinson told BBC Look East. "We can't do what some teams can do. But I want to bring him here for the foreseeable future. "I've been very respectful with Watford and they've been very respectful with me. We've had conversations on a daily basis. We don't want to upset the apple cart from their perspective." Last week Robinson said his side, Watford and Bolton had "unofficially" agreed terms on a deal. But it seems a return to Stadium MK for Andrews, who played 87 times for the Dons between 2006 and 2008, is still some way from being confirmed. "The way it is right now, Keith Andrews wants to play for MK Dons, or go back to Watford. And we believe Watford don't want him back there," said Robinson. "He's got nowhere to train. So he's training on his own with our fitness coach, which he's legally allowed to do. He's constantly in contact with Watford and the FA, so they know his whereabouts. "So he's in a bit of no-man's land at the moment. He's desperate to be here."